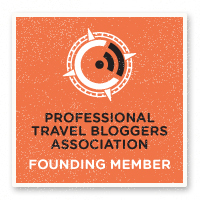 Backpackers, flashpackers and other long-term travelers have to be on their toes when it comes to safety and security issues on the road. Obviously, not enough awareness and common sense can get you into trouble and too much concern will make you overly paranoid. As a traveler, you prepare for the worst and hope for the best. One thing I never expected to run into was counterfeit currency. When you first step foot in a new country, one of the first things you need to do is get the domestic currency. As a smart traveler, you likely hit up the travel exchange in the airport/train station or find a bank recommended by the guidebook. Backup options include the random ATM or any bank you can find that will let you exchange one currency for another. Two travel mates of mine spent a day last week at the famous Silk Market of Beijing. Running low on cash, one of them hit the closest ATM, which happened to be in the subway station. She withdrew a fair amount of money, planning on being in China for another 25 days, and thought nothing of it. Two things to note before I continue: 1) The bank notes are in 100 Yuan bills (just shy of $15 U.S.) and 2) the subways are secure locations with a lot of security and even do bag checks. The first indication of a problem happened that later night when she tried to pay for our cab. He wouldn’t accept any of her bills and we got away with what small change we had on us. A couple hours later at Beijing’s only speakeasy, she tried to use another of her bills and that’s when the server told us that it was counterfeit. We got a brief lesson on how to tell the real bills from the fake ones and quickly realized that the rest of her money was counterfeit as well. Because she’d taken out much more than she had on her, we decided to call it a night and head back to the hostel so she could check the rest of her money, which, much to her relief, turned out to be real. 500 Yuan (about $74 U.S.) of 3000 in total was fake. Keep in mind, this was all from a bank’s ATM in a secure location. One counterfeit 100 Yuan bill (top) and one real 100 Yuan bill (bottom) shows how difficult it is to tell the real from the fake. 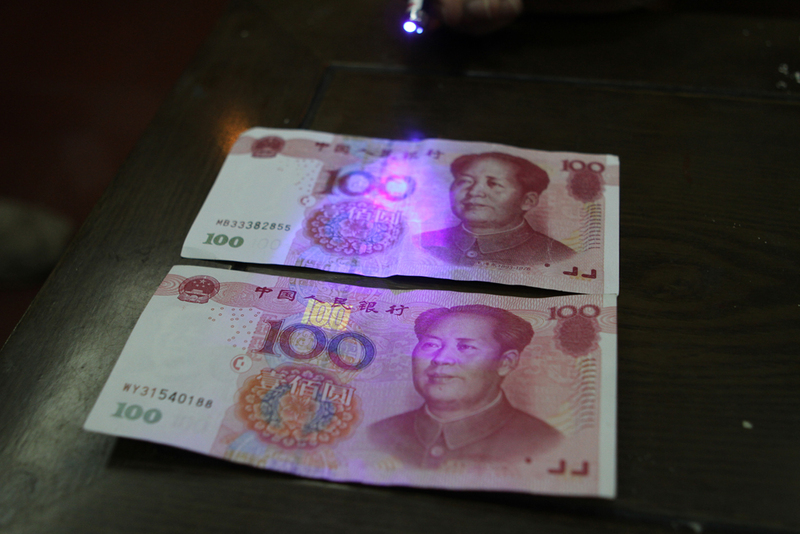 For Chinese Yuan, there are a number of ways to tell the phony money from genuine bills. 1) The first, and most common method, is by feeling “Mao’s Collar”. The print on the bill around the collar on Mao’s neck has a very specific texture to it and feels very rough. The fake bills feel very smooth. 2) The best method is to purchase a small, purple light which is very common and used for viewing a box that only shows up under the light (see pictures). The box will show the value of that bill under the light. The bogus bills do not have the box. 3) With the Mao side facing you, in the upper right corner there is an oval shape just under the value of the bill. If you hold that up to the light at a sharp angle, you should see a number equal to the value of the bill. Those are the three main ways to check for counterfeit bills. The counterfeits even had watermarks and holograms so be careful! To be safe, the best advice is to change money only at legitimate sources and only use ATMs from the biggest banks. Usually your guidebook will recommend where to change money. I went out the next day and purchased one of those lights. They’re inexpensive, easy to use and a reliable way of making sure you don’t run into problems. How does the story end? My friend eventually met with five representatives from the bank who came to the hostel. She explained where she got the money and how she found out it was counterfeit. They brought her gifts and apologies but did not give her authentic money for her fakes. Unfortunately, it was just under the amount required to claim it on her travel insurance. In the end, she paid about seventy-five U.S. dollars for a souvenir book, some moon cakes and a story to tell. Have any experience with counterfeit currency while on the road? What happened to you? 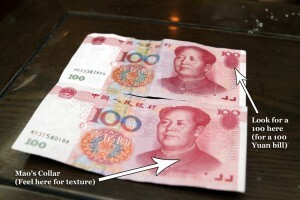 I live in china and run into counterfeit currency frequently. Chinese people get stuck with it to, so assuming everyone might have a couple fake bills to get rid of, be very careful when receiving change as Chinese people will often try to get rid of their fakes on foreigners who are less likely to notice. Its not malicious, but the best strategy is to do the same thing. If you get stuck with some fake bills, try to use them first. Place them between real ones when paying for things, try to spend them when a vendor is busy and is less likely to take the time to check thoroughly or in a dark bar where they can’t study them as clearly. They might get rejected several times but remember that whoever had them before you made a mistake, and so eventually somebody after you will too. The whole country is full of cons, the counterfeiting will eventually ruin them in the end. Isn’t this an interesting lesson in fiat currency? Trading scraps of paper as if they had no inherent value, just the ability to pawn it off on the next guy. Ironic. Helpful post Travis. Thanks! I wish I had seen this before my 7 week trip to China this year. ALthough some of my friends were unlucky with fakes I never got stopped which probably meant my bills were ok. I always got my money from Bank of China ATMs or well known banks. I’m sure even if I had one I was able to pass it off and so it continues just like Eggers mentions. Good post on a problem everyone who goes to China encounters one time or another. I’ve gotten counterfeit 10 RMB notes – who counterfeits a buck fifty? I might suggest, however, that travelers should get their cash from ATMs rather than bringing foreign currency. Rates are much lower, and I’ve used some banks at home that charge NO ATM fee, even when it’s overseas. Spreads are pretty low at many banks, so you get a rate closer to spot than any money changer will give you. Granted, that won’t alleviate all issues in China since ATMs there have been known to dispense fake notes, too. But it’s good advice for most other places (except those places with no ATMs, obviously). We got about 2000 RMB from a well known ATM and about 500 of it was fake. The banks do nothing about it. I would pay the fee to exchange currency at a reputable place rather than use the ATM’s and lose 25% of your funds with no recourse. I recently exchanged my 200 US for RMB at ICE International Foreign Exchange Counter at JFK Airport, 600 out of the 1000 RMB that I received turned out to be fake!! Got no refund when I returned there with receipt in hand a week later. It seems that the only real way to escape it is by educating yourself,since very few places in China accept international or debit credit cards. I lived in Beijing from 2007-2011 and heard that you could get fake Y100 bills from ATM machines. However I never had problem with Y100 bills from ATM machines, but occasionally picked up a fake Y10 or Y20 from shops and traders. I had always assumed that withdrawing RMB from a reputable bank ATM would be safe. I didn’t have time to go back to the bank as I had to get to the airport, so this was an expensive lesson for me. Someone fairly senior in the bank must be in on this scam, so you’ll need hard evidence to combat this. Not sure what advice I can give to guarantee this won’t happen to you – I would say avoid remote ATMs, but even those right outside a reputable bank are not secure. Thanks for the comment. I’m a little disappointed to hear this is still such a problem four years later. I’d say you’re right, there’s really no way to keep this from happening except to be educated about it and know what makes them fake. Then you can go into the bank immediately after a withdraw and get counterfeit bills. Hopefully you’ll be able to use the bills elsewhere and get your money back. I became a victim of counterfeit currency last week after withdrawing 500 RMB from the bank ATM and as I was doing some shopping, it was established that 100 RMB note was fake. I took it to the bank for verification and I was told it was counterfeit yet the source was ATM. The bank seized the fake note, took my details and gave me a receipt. I have never understood how the fake note found its way to an ATM.